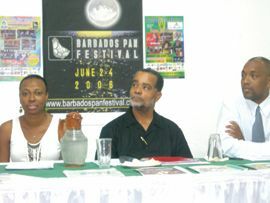 Rythmix Steel Orchestra will be representing this country at this yearâs Barbados Pan Festival. The local launching of the event was held here in St. Vincent and the Grenadines last Thursday at the Royâs Inn Hotel. Chief Executive Officer of the Festival, Michael Murray said that he is very excited about this yearâs festival because there are lots of surprises in store. The Pan Festival willrun from the June 2 to June 4. Rhythmixâs participation is sponsored by Digicel.